Prefetch and Superfetch are two Windows modules that speed up Windows in general. Prefetching does this by writing application information (like the files that need to be loaded to memory) to speed up the loading process. Superfetching on the other hand uses a complex algorithm to determine the most used applications on a system to preload them partly into the memory. Prefetch has been integrated into Windows XP and later operating systems while Superfetch was added to Windows Vista and later. These two functions of Windows are generally best left untouched as disabling or clearing their information can result in permanent or temporary performance degradation. But there are situations where advanced users might want to have access to the Prefetch and Superfetch settings. One example where this might be necessary is a computer system with SSD (Solid State Drives). Windows Vista for instance has no routine implemented that changes the superfetch or prefetch parameters based on the type of drive. Microsoft has changed this behavior in Windows 7 which determines the correct settings after initial speed tests of the connected drives. These speed tests might have it wrong at times. It is generally said that Superfetch can be disabled on fast SSDs. Another example where turning off Superfetch might help is a system that is constantly low on computer memory. The TweakPrefetch utility gives advanced users the tool at hand to configure Prefetch and Superfetch individually. 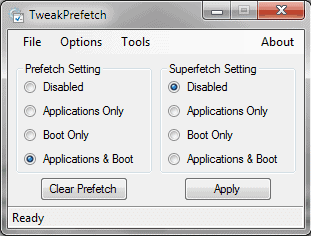 It is possible to set both Prefetch and Superfetch to one of the following states: Disabled, Applications only, Boot only and Applications and Boot. The prefetch information can also be deleted in the application by clicking on the Clear Prefetch button. A reboot is required after making changes to those settings. Windows 7 users with Solid State Drives will find this official information from Microsoft about Defragmentation and Superfetch helpful. TweakPrefetch is a free software program for the Windows operating system that seems to require the Microsoft .net Framework. It can be downloaded from the developer's website.